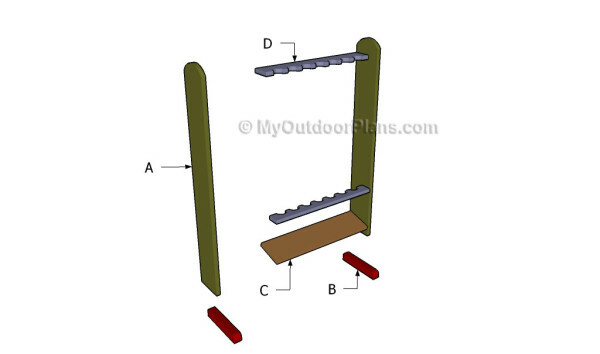 This step by step project is about fishing rod rack plans. If you want to organize all your fishing rods and to keep them properly or you just need a wooden display rack, we recommend you to pay attention to the instructions described in the article. Therefore many designs and sizes to choose from, so make you you adjust the look and the size of the rack to suit your needs. Make sure you follow me on Facebook to be the first that gets our latest plans and for some other exclusive content. Also, follow me on Pinterest to get many ideas for your backyard from all the internet! See how you can Support Us with no extra costs to you. The first step of the woodworking project is to build the sides for the fishing rod rack. 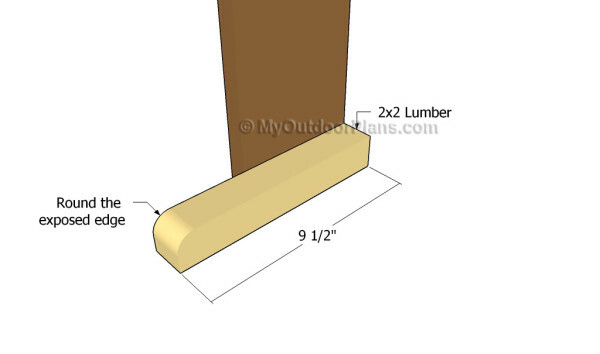 In order to get a professional manner, we recommend you to cut the sides out of 1×6 lumber. 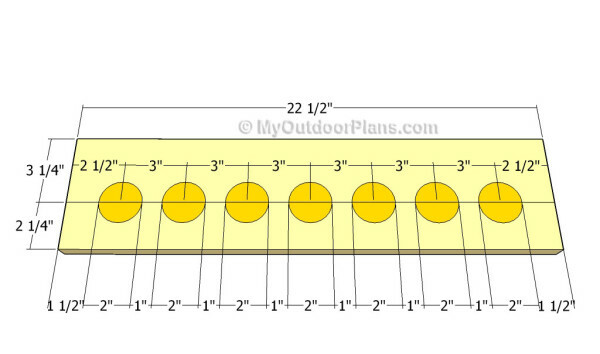 Make sure the slats are in good condition and take accurate measurements. Top Tip: Smooth the cut edges with fine-grit sandpaper and make the top of the components round. Repeat the process for the other side of the fishing rod rack. 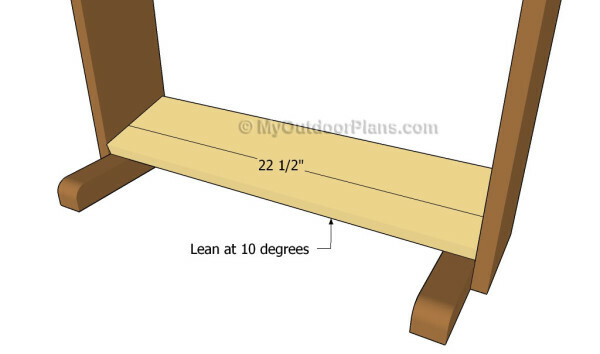 Build the base of the fishing rod rack out of 2×2 lumber. In order to get a professional manner, we recommend you to round the exposed front edge of the component. Drill pilot holes through the base, align it with attention and insert 2″ into the side components. Add glue to the joints in order to enhance the rigidity of the bond. 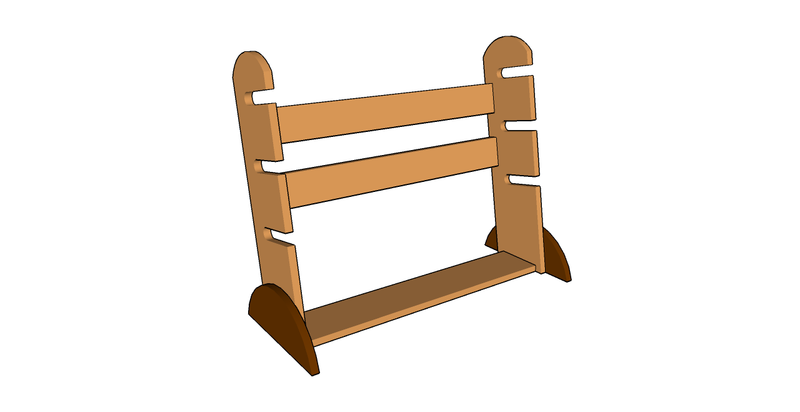 The next step of the woodworking project is to attach the bottom to the fishing rod rack. In order to get a professional result, we recommend you to drill pilot holes at both ends and to secure it to the side using 1 1/4″ screws. Add glue to the joints and lean the bottom support at 10 degrees. Align the component with attention before inserting the screws, making sure the edges are flush. Building the supports for the fishing rod rack is a straight-forward process, but you need to pay attention to several aspects, as to prevent costly mistakes. Therefore, we recommend you to mark the cut lines on the slat with attention. Top Tip: Take accurate measurements and adjust the distance between the holes, according to the size of your fishing rods. It is essential to customize the size of the supports to suit your needs. 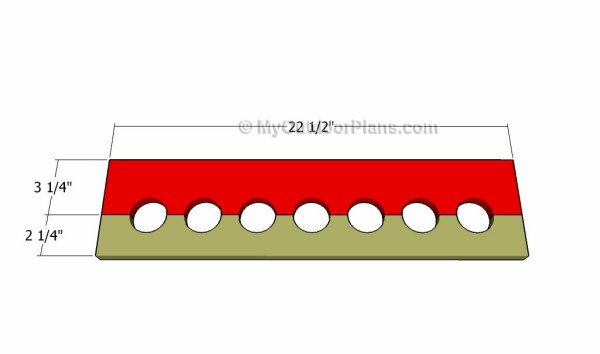 Use a 2″ holes saw drill bit to cut out the round holes into the slat, as seen in the diagram. Alternatively, we recommend you to drill a starting hole and to get the job done with a jigsaw. Afterwards, use a circular saw to split the components by making a cut along the middle of the holes, as shown in the diagram. Attaching the supports at the right size is essential to get a professional result. 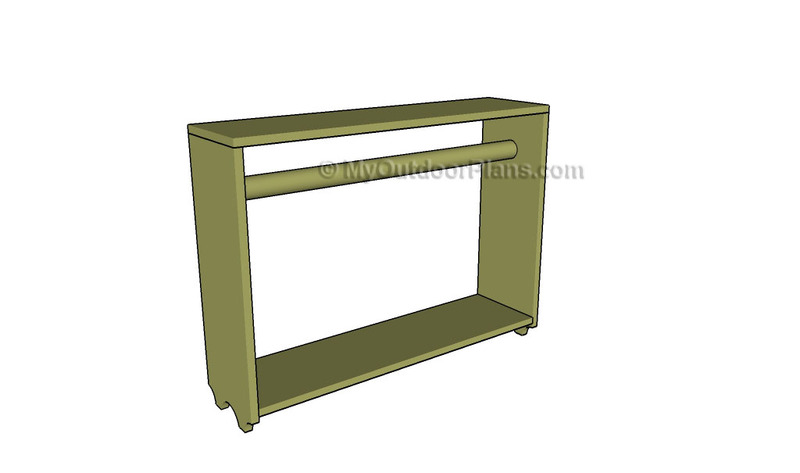 Therefore, you need to drill pocket holes at both ends of the supports before fitting them between the sides of the rack and locking them into place. Align the top components to the back edge, making sure the edges are flush and use a spirit level to make sure it is horizontal. Insert 1 1/4″ screws into the sides. Add waterproof glue and remove the excess. Align the bottom to the front edge and secure it to the sides with 1 1/4′ screws. Add glue to the joints. Top Tip: Apply several coats of stain or paint to enhance the look of the fishing rod rack and to protect the components from decay. Check out the rest of the project, to how how to build the deck stair rails. 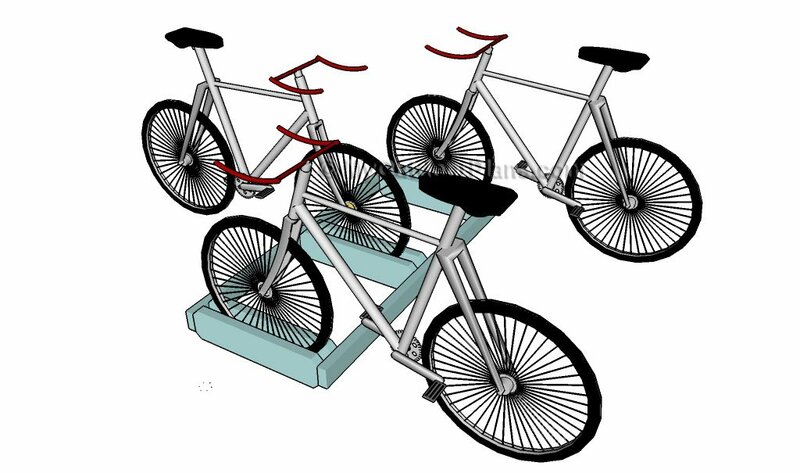 This project was about fishing rod rack plans. 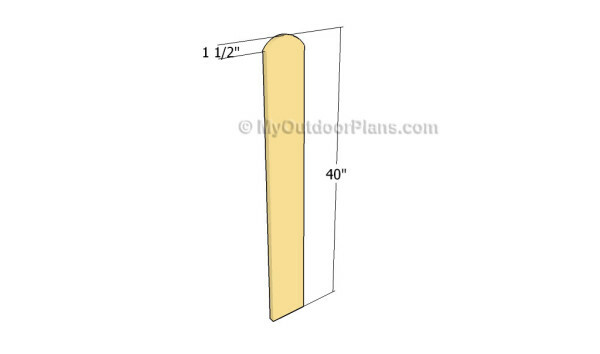 If you want to see more outdoor plans, we recommend you to check out the rest of the projects. Don’t forget to share our projects with your friends, by using the social media widgets. 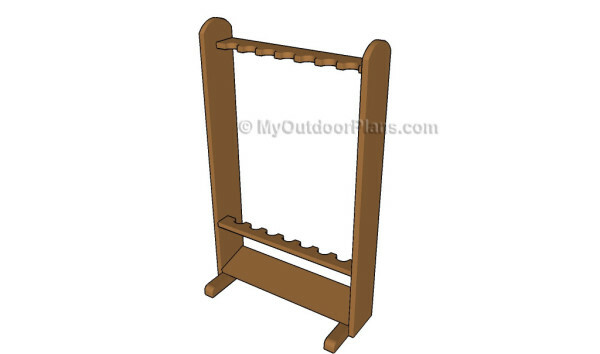 I found plans for a rod rack very similar to this same one, on Minwax’s website. I’m pretty good at following step by step plans as well as having to “MacGuyver” things to make them work (due to me having very limited tools to work with. However, I’m technically a beginner or novice or whatever you want to call it, when it comes to wood working. Anyhow, the step by step plans that Minwax’s gave were fairly vague & said nothing at all about what size the holes were supposed to be for the support rails (which is why I had to Google it). I am very thankful for having found your set of plans, as they are more clearly detailed. 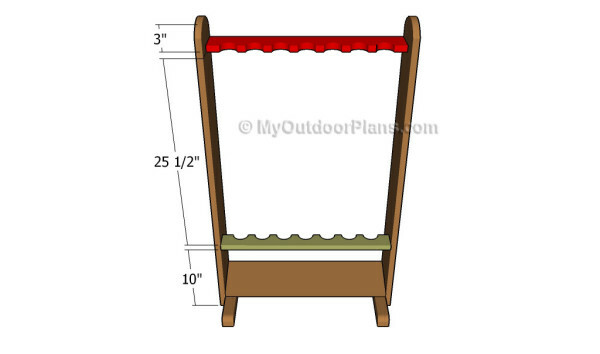 I’m building this rod rack for my husband, to give to him as part of his Valentine’s Day gift & was worried about screwing it up until I came across these plans. THANK YOU VERY MUCH! & I will definitely be returning to your website when I start other projects in the future!! Again, THANK YOU, THANK YOU, THANK YOU!!! This is a common design. I took the inspiration from an old fishing rod rack my grandpa had when I was a kid. That’s lovely you build this for your husband and I am sure he will like it! Let me know how it comes out, I would love to see it! The measurements for drilling the holes are off by 1/2 in. The total length of the support is 23″ if you add it up in the figure above… Easy enough to adjust but might want to update the drawing. Other than that, real simple plans and easy to construct!